Although we do not have a television and demand to sit away from any television screen located in a restaurant on the very, very rare occasions these days when we dine out (in the days when we did so more frequently when living in our motor home, whose kitchen facilities were not the most extensive), I did manage to follow (via the wireless connection that fits into my notebook computer) a good deal of the final eight hours of the rescue operation that lifted the thirty-three men who were trapped undergound at the San Jose Copiago Mine near Copiapo, Chile, after being trapped there following a collapse of rocks on August 5, 2010, the Feast of the Dedication of the Basilica of Saint Mary Major. Remarkable scenes unfolded as the culmination of nearly two months of careful logistical planning and engineering feats that required pinpiont accuracy resulted in the rescue of each of the thirty-three men and the recovery of the six rescue workers who had been sent down one-half mile below the surface of the earth to coordinate the rescue as they prepared the trapped mine for their ascent out of their involuntary sanctuary. 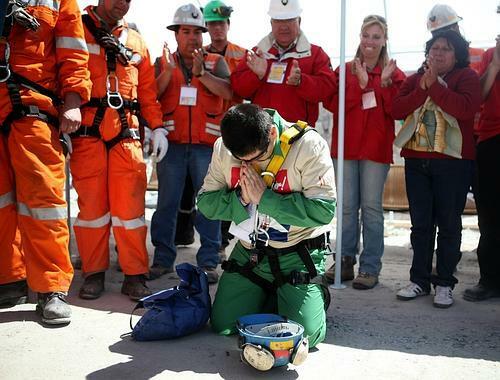 Many prayers were offered for the physical safety of the trapped miners, whose fate was unknown until seventeen days after the mine collapse. It was on Sunday, August 22, 2010, the Feast of the Immaculate Heart of Mary, that initial efforts to reach the miners through a "bore hole" confirmed that they were alive. Food and medical provisions were then shipped down via the bore hole as the sophiscated means of modern communication made it possible for the men to speak their family members. Chilean President Sebastian Pinera staked his presidency, to which he was elected on January 25, 2010, and sworn into office on March 11, 2010, eleven days just after the Chilean earthquake, on his belief that the miners could be rescued, something that many of his closest advisers believed was not prudent for him to do. The prayers of millions of Chileans and others worldwide were answered, starting late on the very date that Christopher Columbus had landed on the Island of San Salvador in the year 1492, that is October 12, as the resuce capsule was sent down at 11:18 p.m. Chilean Daylight Saving Time, ermerging first miner to be rescued, Florencio Avalos, who emerged at 12:11 a.m. on October 13. The process continued throughout the day on the ninety-third anniversary of the Miarcle of the Sun in the Cova da Iria near Fatima, Portugal, with the last miner, Lewis Urzua, the foreman of the crew, being extricated at 9:55 p.m., Chilean Daylight Saving Time. Although we are prone to use the word miracle very loosely these days (the conciliar Congregation for the Causes of the Saints uses that word very, very loosely in accepted bogus "miracles" for their bogus "beatifications" and "canonizations"), I believe that it is just and appropriate to refer to the events that transpired at the San Jose Copiago Mine to be miraculous, especially when one considers that Chilean President Sebastian Pinera was urged by some of his Cabinet ministers and advisers not to attempt a rescue mission and that the trapped men were able to survive for seventeen days until they were discovered. Beginning at midnight Tuesday, and sometimes as quickly as every 30 minutes, the pod was lowered the nearly half-mile to where 700,000 tons of rock collapsed Aug. 5 and entombed the men. Then a miner would strap himself in, make the journey upward and emerge from a manhole into the blinding sun. The rescue was planned with extreme care. The miners were monitored by video on the way up for any sign of panic. They had oxygen masks, dark glasses to protect their eyes from unfamiliar light and sweaters for the jarring transition from subterranean swelter to chilly desert air. As they neared the surface, a camera attached to the top of the capsule showed a brilliant white piercing the darkness not unlike what accident survivors describe when they have near-death experiences. The miners emerged looking healthier than many had expected and even clean-shaven, and at least one, Mario Sepulveda, the second to taste freedom, bounded out and thrust a fist upward like a prizefighter. As it traveled down and up, down and up, the rescue capsule was not rotating as much inside the 2,041-foot escape shaft as officials expected, allowing for faster trips, and officials said the operation could be complete by sunrise Thursday, if not sooner. The first man out was Florencio Avalos, who emerged from the missile-like chamber and hugged his sobbing 7-year-old son, his wife and the Chilean president. Leaving aside all of the remarkable feats of engineering and skill that made possible the physical rescue of the miners, there are some other aspects to this amazing episode that should gave us pause for a bit of reflection. First, there were thirty-three men trapped in the mine. How old was Our Blessed Lord and Saviour Jesus Christ when He was crucified? Second, the mine was named after Our Lord's foster-father, Saint Joseph. Third, some secular media reports included quotes, such as the one given by Priscilla Avalos, that mention the name of a saint or two. Saint Lawrence, of course, was mentioned at the patron saint of miners. At least a few people now know that Saint Lawrence is indeed the patron saint of miners. 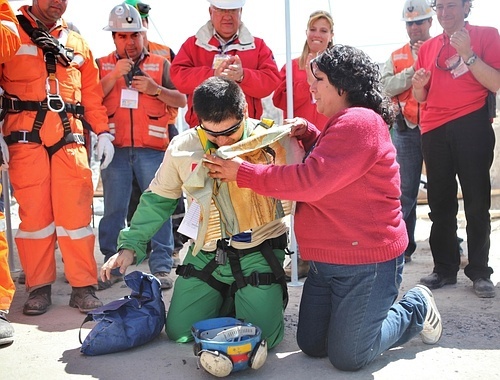 Esteban Rojas, the eighteenth miner to be rescued, prays as his wife holds an image of Our Lady of Guadalupe on Wednesday, October 13, 2010. Our Lady of Guadalupe was indeed showing herself to be in charge of the entire mission to rescue the miners. Although much could be written on the fact that those of the rescued miners who have not been concerned up until the accident about their eternal salvation will now understand that they have been given a chance by God to get themselves straight with Him, at least by being dedicated to His Most Blessed Mother by means of her Most Holy Rosary (given the fact that there are not a lot of locations where Catholics in Chile can receive the true Sacraments in our current state of apostasy and betrayal), what I want to focus on in this very short article (this website's traffic is going down even with the shorter articles that some readers have been clamoring for over the years!) is the fact that Our Lady is just as much in charge of the rescue of the Church Militant on earth as she was in charge of the mission to rescue the thirty-three men who were trapped in the mine named for her Most Chaste Spouse, Saint Joseph, the Patron of the Universal Church and the Protector of the Faithful. Our Lady will lead us out of the caves of the catacombs where we are entombed at this time. Our Lady will lead us out of the caves of intense sufferings that so many people who understand the true state of the Church Militant at this time are enduring from their very own family members and friends and former associates as they are mocked and reviled and yelled at because they have embraced the truth without compromise and even though that they have nothing earthly to gain by doing so. Our Lady will lead those Catholics who do not realize that they are entombed in caves of apostasy and betrayal and sacrilege into the light of the truth as her Fatima Message is fulfilled by a true pope and the errors of Russia, which we see on full display around the world, including right here in the United States of America even though so many people are blinded by their refusal over the decades to admit that this is so. Our Lady will confound the wise and those who count themselves as something in this passing, mortal vale of tears just as the physical resuce of the once trapped Chilean miners astounded even some of the top experts in the world on such rescues. The City of Mary Immaculate will flower as the Social Reign of Christ the King is restored. Why do we fret so much? Why do we live in so much fear and trepidation as a result of the plans of civil and pseudo-ecclesiastical potentates who will be but minor footnotes when the Triumph of the Immaculate Heart of Mary is made manifest? Why do so many Catholics, of all people, think that praying the Rosary is "doing nothing" to convert souls and nations to the true Faith, without which neither men or their nations can know true social order? Why do we complain so much about our crosses and our sufferings? Why are we slow to recognize that there is nothing we suffer that is the equal of what one of our least Venial Sins caused Our Blessed Lord and Saviour Jesus Christ to suffer in His Sacred Humanity during His Passion and Death and that caused His Most Blessed Mother to suffer as the Swords of Sorrow were plunged deeper and deeper into her Immaculate Heart. Why do we not take these words of the Virgin of Guadalupe seriously as did Mrs. Esteban Rojas? And what is your reason for worry or complaint? You have none. None of us do, do we? We have nothing to fear from being entombed in the caves of the present moment by the lords of the counterfeit church of conciliarism or the lords of Modernity. Aren't we willing to put forth our own best effort now, today, the Feast of Saint Teresa of Avila, Friday, October 15, 2010? Our Lady's Most Holy Rosary is more powerful than the dark forces that seem so powerful right now. We need to fear only one thing: dying in state of final impenitence, and for this, too, of course, we have recourse to Our Lady, the very Mother of God who was conceived without any stain of Original or Actual Sin, the Mediatrix of All Graces through whose loving hands flow the supernatural helps that come to us by virtue of the shedding of every single drop of her Divine Son's Most Precious Blood on the wood of the Holy Cross. We know that Our Lady's Fatima Message, replete with its request that we pray her Most Holy Rosary in reparation for our sins and those of the whole world, will see to their forcible exit from that stage. All we have to do is to surrender ourselves as the consecrated slaves of Our Lord through her own Immaculate Heart. Another October 13 miracle awaits us, does it not? Our Lady has told us so. Why do we doubt her word?